Queen Anne's Revenge: semi-permanence in all it's glory! I could write a novel about the first year we spent in this house, the fact that we just got our occupancy permit a month ago - meaning the house was considered uninhabitable and we were technically living here illegally - may illustrate just how bad things actually were. 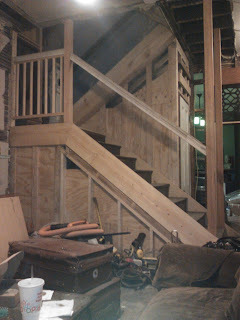 But since I'm not ready to revisit that trauma, lets talk about the first project we chose to do, the stairs. The 1st to 2nd floor stair was ripped out during the conversion to a three family, leaving what should have been a grand hall a 15 square foot space with 5 doors, and getting upstairs required winding through another 5 doors and three flights of stairs. There was no heat, water, or electricity upstairs (and very few walls), so every morning our first winter in the house we'd throw on our winter coats, hats, gloves and boots and go to work. You'd think after that we'd be content to appreciate having some working radiators the following winter, instead, we tore the front off the house . . . . Guiding this restoration was a turn of the century photo (seen in the first post) that we were able to find after about a 1000 hours of research. Not only had the stairs been torn out - the room you see being removed was a vestibule for the 2nd and 3rd floors - the orientation of the house had been changed. The current front doors are cut into what used to be a bay window, and as we found out the house's original entrance faced down the hill, and in fact had owned all the land down to the main road. We're saving up the major funds needed to work on the porch, but until then, we have a semi-permanent stair by which to navigate our shack. Why semi-permanent you ask? Well, because quartersawn cherry (what the original stair was) is incredibly expensive - so our salvaged bits and pieces will have to do, but at least the framing is good to go!